*Address correspondence and re-prints request to: Dr. Dileep K. Rohra, College of Medicine, Alfaisal University, P.O Box 50927, Riyadh 11533, Saudi Arabia. Objectives: Research activities are promoted at the government and the institutional levels in Oman. However, the quantity and quality of research conducted in various institutes of Oman has not been measured. Therefore, this study was conducted to analyze the quantity and quality of biomedical publications emanating from Oman over the last five years (2005-2009). Methods: Data regarding the biomedical publications of Omani origin published from January 2005 to December 2009 were retrieved from Pubmed. All abstracts were manually checked to exclude false retrievals. The journal impact factor (IF) for 2008 was applied for every publication. Full-length original articles, review articles and publications mentioning new research methods/new technique were assigned full IF of the journal. However, half of the journal IF were assigned to correspondences/commentaries, case reports/series and short communications. Results: Of biomedical publications, 752 were retrieved from Pubmed and 519 publications were included for final analysis after excluding false positives. The number of biomedical publications steadily increased over the last five years, but it was not statistically significant. Original research articles constituted more than half (54.3%) of all the publications, followed by case reports/series (30.1%). Sultan Qaboos University (SQU) contributed more than half of the biomedical publications (51.5%), followed by the Ministry of Health (MoH), which contributed 38% of the publications. Interestingly, the mean IF of the publications was not significantly different throughout the years. Conclusions: The number of publications emanating from Oman increased over the last five years; however, the quality of research has not improved. Furthermore, the research in Oman is mainly conducted by the government-run institutions and there is hardly any contribution from the private institutions. 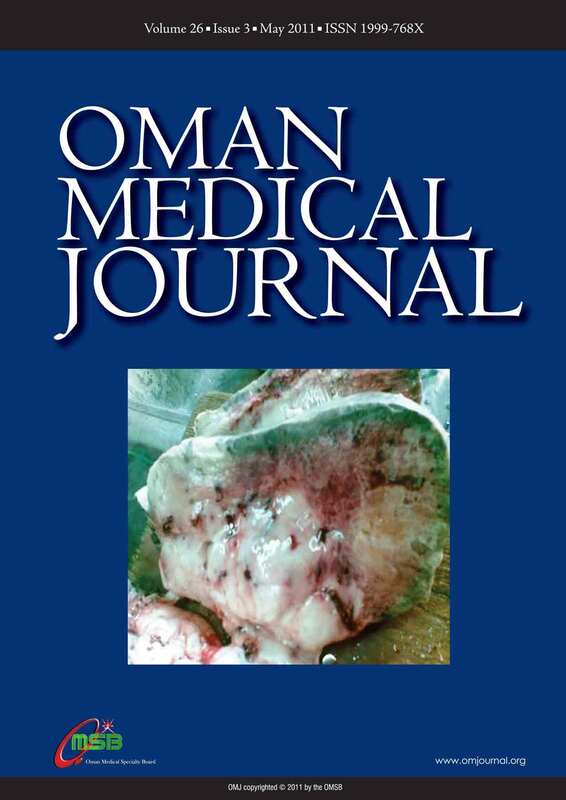 Keywords: Biomedical research; Journal impact factor; Publications; Pubmed; Oman. 5Department of Pharmacognosy, Karavali College of Pharmacy, Mangalore, Karnataka India. *Address correspondence and reprints request to: Dr. Ashok Kumar BS, Department of Pharmacognosy, Sri K.V. College of Pharmacy, Chickballapur, Karnataka-562101, India. Objectives: The present study was aimed to investigate the α-amylase inhibition and antioxidant activities of methanolic extract of Amaranthus caudatus Linn (MeAc). Methods: Methanolic extract of Amaranthus caudatus was screened for α-amylase inhibition activity by CNPG3 method (2-chloro-p-nitrophenyl-α-D-maltotrioside) and antioxidant activity was evaluated by 1,1-diphenyl-2-picryl-hydrazile (DPPH) free radical scavenging, superoxide dismutase (SOD) scavenging, hydroxyl free radical scavenging, nitric oxide (NO) radical scavenging, and 2.2’-azinobis-3-ethylbenzothiazole-6-sulfonic acid (ABTS) radical scavenging assays. MeAc was also screened for non enzymatic hemoglycosylation. Results: The methanolic extract of Amaranthus caudatus showed potent α-amylase inhibition activity (IC50 19.233 µg/ml). MeAc showed significant antioxidant activity in all the in vitro antioxidant models. Furthermore, the MeAc was found to be extremely effective in scavenging ABTS radical activity (IC50 48.75±1.1 µg/ml) when compared to DPPH (IC50 77.5±0.4 µg/ml), SOD (IC50 62.5±2.1 µg/ml), hydroxyl (IC50 88.50±1.8 µg/ml) and NO (IC50 67.5±2.2 µg/ml) scavenging activity. Conclusions: The methanolic extract of A. caudatus showed potent α-amylase inhibition and antioxidant activities. Keywords: Amaranthus caudatus; α-amylase inhibition; Antioxidant activity; Superoxide dismutase. *Address correspondence and reprints request to: Dr. Hazem M. Zakaria, Assistant Professor & Consultant Surgeon, Department of Surgery, Dammam University, Kingdom Of Saudi Arabia, P.O Box 40081, Al-Khobar 31952. Methods: Between April 2006 and March 2010, 21 cases of laparoscopic interventions were performed for the salvage of malfunctioning CAPD catheter. Two trocars (5 mm) were used. Recorded data included patient demographics, catheter implantation method, date of malfunction, cause of dysfunction, procedure performed and complications. Results: The primary etiology of dysfunction was omentum and/or small bowel wrapping with adhesions in fifteen cases, malpositioning in four cases, and tunnel infection in the remaining two cases. Adhesiolysis was performed in cases with adhesions. In the cases with malpositioning but no adhesions, the catheters were repositioned in the pelvic cavity. Two catheters had to be withdrawn and exchanged because of infection. There were no mechanical or infection problems. The overall success rate of catheter function (>30 days after laparoscopy) was 100%, except for two cases in which the catheters had to be removed. Conclusion: Laparoscopy is a safe, highly effective and successful method for the evaluation and management of peritoneal dialysis catheter dysfunction. Keywords: Peritoneal dialysis; Catheter malfunction; Laparoscopy. *Address correspondence and reprints request to: Dr. Vishal Sharma, Department of Microbiology, Government Medical College, Amritsar, Punjab, India. Objectives: With the increase in nosocomial infections caused by coagulase negative staphylococci (CNS), laboratory diagnosis of CNS with reduced susceptibility to glycopeptides (vancomycin and teicoplanin) has become important. This study was designed to determine the glycopeptide susceptibility of clinical isolates of methicillin resistant coagulase negative staphylococci (MRCNS) at the department of microbiology, government medical college and hospital, Amritsar, India. Methods: A total of 250 CNS isolated from various clinical specimens were speciated and their methicillin resistance was detected by studying the minimum inhibitory concentration (MIC) of oxacillin by macrobroth dilution method. Glycopeptide susceptibility of 130 methicillin resistant strains obtained was determined for vancomycin by vancomycin screen agar test, MIC of vancomycin by macrobroth dilution/and E test. Teicoplanin susceptibility was determined using teicoplanin disc diffusion test and MIC was determined by macrobroth dilution method. Results: All the MRCNS isolates were found to be susceptible to vancomycin and teicoplanin. MIC of vancomycin ranged between £0.5 µg/ml to 1 µg/ml and of teicoplanin from £0.5 µg/ml to 2µg/ml. Conclusion: Continuous monitoring of MIC of vancomycin in MRCNS is required to prevent the emergence of vancomycin resistance in these multidrug resistant organisms. Keywords: Glycopeptides; Minimum inhibitory concentration. *Address correspondence and reprints request to: Mea`ad Kadhum Hassan, Department of Pediatrics, College of Medicine, University of Basrah. Objectives: Environmental factors play an important role in the pathogenesis of type 1 diabetes mellitus, many of these factors have been uncovered despite much research. A case-control study was carried out to determine the potential maternal, neonatal and early childhood risk factors for type 1 diabetes mellitus in children and adolescents in Basrah. Methods: A total of 96 diabetic patients who have been admitted to the pediatric wards at 3 main hospitals in Basrah, and those who have visited primary health care centers over the period from the 4th of November 2006 to the end of May 2007 were recruited. In addition, 299 non-diabetic children were included, their age ranged from 18 months to 17 years. Results: Family history of type 1 diabetes mellitus and thyroid diseases in first and second degree relatives was found to be an independent risk factor for type 1 diabetes mellitus, (p<0.001). Regarding maternal habits and illnesses during pregnancy, the study has revealed that tea drinking during pregnancy is a risk factor for type 1 diabetes mellitus in their offspring, (p<0.05). In addition, maternal pre-eclampsia and infections were found to be significant risk factor for type 1 diabetes mellitus, (p<0.001). Neonatal infections, eczema and rhinitis during infancy were also significantly associated with development of type 1 diabetes mellitus. Moreover, the results revealed that duration of <6 months breast feeding is an important trigger of type 1 diabetes mellitus. Conclusion: Exposure to environmental risk factors during pregnancy (tea drinking, pre-eclampsia, and infectious diseases), neonatal period (respiratory distress, jaundice and infections) and early infancy are thought to play an important role in triggering the immune process leading to B-cell destruction and the development of type 1 diabetes mellitus. Keywords: Type 1 Diabetes Mellitus; Risk factors; Children; Adolescents. Dysgerminomas are the most common of primitive germ cell tumors of the ovary, accounting for 1-5% of all ovarian malignancies. The reproductive age group females are most commonly affected, thereby causing problems in conception and if pregnancy occurs, it leads to feto-maternal compromise. It is extremely rare to have a successful natural pregnancy, with viable child birth with a coexisting dysgerminoma, without any assisted reproductive interventions. We hereby report a case of successful spontaneous natural pregnancy in a primi gravida, associated with dysgerminoma, with no feto-maternal compromise. Keywords: Dysgerminoma; Natural pregnancy; Viable birth.